More than likely, you live somewhere that requires lights to see at night. If this is the case, and you’d like those lights to be made from old motorcycle parts, please continue. If this is not the case, please continue. Because this is Urban Light Factory, a Berlin-based workshop that’s taking the headlights from vintage cars and motorcycles, attaching them to handmade bases and calling them lamps, now available online. Picture a 1922 Belgian FN motorbike. Picture what allowed it to be ridden at night. Now picture that night-ride-allowing thing also lighting your living room. Right. Begin your perusal at the top of the site with the Otto. 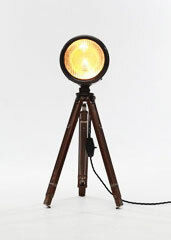 It’s a 25-watt halogen floor lamp made with a headlight from the same motorcycle the owner’s grandfather used to ride. Keep going. Notice how some lamps have the original speedometer installed into the side. Make your way down to the pendant lights that go by the names Red, Black and Blue. Three guesses as to the colors of each. And if you don’t find anything you like, you can send in a headlight of your own, and they’ll make you a custom piece out of it. You’d be surprised what a touch of Camry can do to a space.